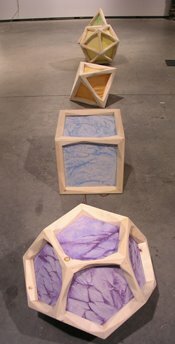 "In this installation, Eidse has created five objects based on Platonic solids, each with corresponding colour and sound. The viewer is encouraged to examine the relationships between the objects and the space itself. Just like ancient and contemporary scientists, Eidse believes that through our perception we can apprehend portions of a 'still' material substance which is, in reality, in constant motion." He's always been super creative and introspective, so it's cool to see his vision coming alive like this. Mal's one of those people I feel quite connected to, but despite living close by, we've been terrible at maintaining our relationship. We used to at least hang out at Big White and ride together a couple of times each winter. I'll have to stop by the Bean Scene this summer and say hi.